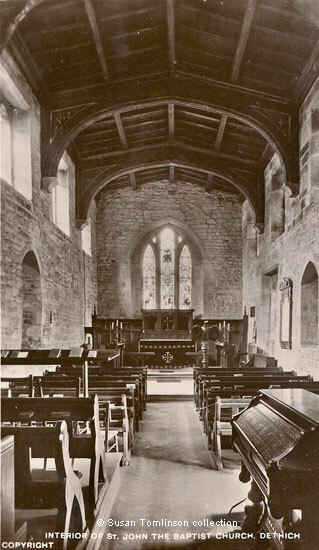 Dethick's chapel, an off-shoot of the mother-church of Ashover, was founded in 1279 by Sir Geoffrey Dethick and Thomas, the Prior of Felley in Nottinghamshire. However, the church historian John Charles Cox noted that a license for the celebration of divine service had been applied for about 50 years before it was founded/endowed and it is now accepted that the chapel was built in 1220. Cox also commented on the two deeply splayed lancet windows on either side of the chapel, dating from about 1225, that were in the Early English style and part of the original building. The top photograph dates from 1875. 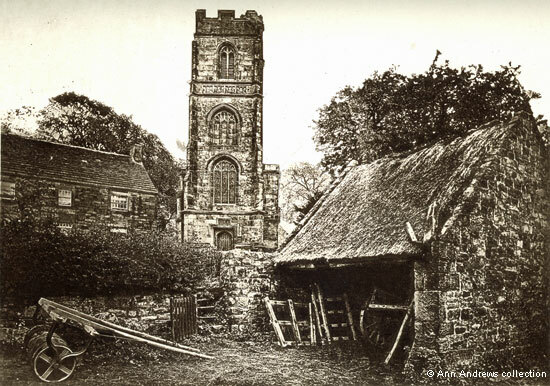 It shows both the church and Church Farm, together with an old outbuilding. Manor Farm, the former home of the Babingtons, is nearby. The chapel has a chancel, nave and a tall west tower, though no aisles. The late Perpendicular west tower was built in 1532 (the date is on the west front) by Sir Anthony Babington who died in 1544, aged 69. There is a frieze around the tower, decorated with various arms (shields) of the Babington family, but these have been damaged and even in Cox's time were indecipherable. The Babington's of Dethick descended from Thomas Babington, who had married Isabella, the last of the Dethick line, some time before 1432. However, the Babington most people associate with Dethick is another Anthony Babington, great grandson of the builder of the tower, who was involved in a plot (the Babington Plot) to rescue Mary Queen of Scots, and to destroy Queen Elizabeth I. As a sixteen year old boy he had been a page to Mary, whilst she was imprisoned at Sheffield Castle, and was later persuaded to take the leading part in the plot. He was executed for high treason on 20 September 1586. Mary Queen of Scots had been imprisoned at Wingfield Manor but was moved to Tutbury, where her correspondence with Babington seems to have begun, and then to Chartley. She was finally sent to Fotheringhay where, following her trial, she he was executed the following February. Normally, the Babington property would have been escheated (confiscated) for the Queen but Anthony Babington was clearly aware of the enormity of what he was about to undertake and the dire consequences if he failed. He therefore made the Manor of Dethick over to his brother George, along with other property he owned. Despite Anthony's forward planning, George proved to be extravagant, and the estate had to be sold to Wednesley Blackwall. It was eventually owned by the Hallowes and they remained Lords of the Manor until the end of the nineteenth century. Rev. Brabazon C. Hallowes of Morcott, Rutland was Lord of the Manor in 1895, the last of his family to be connected to Dethick. By 1899 John Marsden-Smedley had become the hamlet's patron and chief landowner. Over the Christmas period of 1872 a fire destroyed the almost flat roof and the necessary repairs, with new timber restored after the old pattern, were only just being completed when the photograph at the top of the page was taken and Cox published his first volume of "Churches". St. John the Baptist is still used for worship, with services held there once a month and at Christmas and Easter. 2. 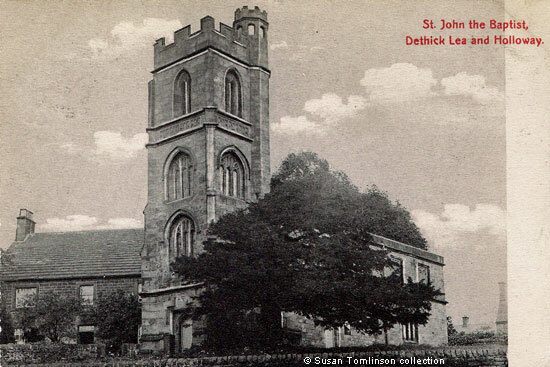 "St. John the Baptist, Dethick, Lea and Holloway". Postcard published by The Scientific Press Ltd., London. Posted in Matlock 17 June 1914. Image © Susan Tomlinson collection. 3. Photograph of Dethick Church, 2011, © Susan Tomlinson. 4. 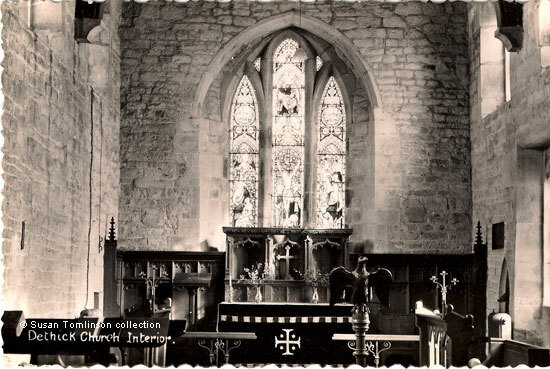 "Dethick Church, Interior". Bevel edged card published by A W Bourne. The date on the back says 1972, but the card is earlier than that. Image © Susan Tomlinson collection. 5. "Interior of St. John the Baptist Church, Dethick". No publisher. Not posted. Image © Susan Tomlinson collection. Researched, written by and © Ann Andrews. Cox, J Charles (1875) "Notes on the Churches of Derbyshire, Vol I, Hundred of Scarsdale", Chesterfield: Palmer and Edmunds, London: Bemrose and Sons, 10 Paternoster Buildings; and Derby. 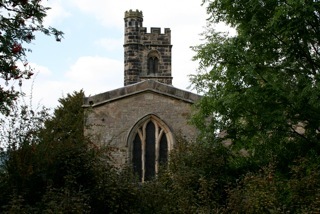 The Babingtons were buried at Ashover. "Kelly's Directory of Derbyshire", 1881 gave the date as 1512 but in their 1887 Directory this had been amended to 1220 and the date did not change in later directories. Cox, John Charles, (1915, 2nd edition, revised), "Derbyshire" - Illustrated by J. Charles Wall, Methuen & Co., London. Cox, in his 1875 book on "Churches" used an eighteenth century account of Ashover and Dethick, by Nichols, that is in the Wolley MSS to work out whose arms they had been. Charles Cox believed that Stephen Glover was mistaken in some of the descent, having misinterpreted a Babington tomb at Ashover (Glover, Stephen (1833) "The History and Gazetteer of the County of Derby ..." Edited by T. Noble. pub. Derby and London). William Wolley's "History of Derbyshire" also corroborates this descent ( Glover, Catherine and Riden, Philip (edited by) (1981) Derbyshire Record Society Volume VI. Anthony Babington was a young man when he became embroiled in the Babington Plot. Arthur Mee ("King's England", 1937) suggests he was fifteen years younger than Mary Queen of Scots, who was born in 1542. This indicates that he was born about 1557. Frazer, Antonia (1969) "Mary Queen of Scots", George Weidenfeld & Nicholson Ltd. Orion Books Ltd. edition ISBN 970-0-7538-2654-6. On the first day of her trial Mary claimed she had never met Babington, had not corresponded with him and did not know the six men who were plotting to kill Elizabeth Tudor. Eventually Babington's " depositions and letters were now read aloud" (ch.25). Ward tells us that Dethick was the property of Thomas Hallowes Esq. of Glapwell in 1814 (Ward, Reverend Richard (1814) "The Matlock, Buxton and Castleton Guide, containing concise accounts of these and other remarkable places ... in the ... County of Derby", Derby). "Kelly's Directory of Derbyshire", 1895. "Kelly's Directory of Derbyshire", 1899. Derbyshire Places of Worship: St John the Baptist's Church, Dethick, Lea & Holloway. This is part of an extensive database for several UK counties (GUKUTILS) researched and maintained by Rosemary Lockie.